Lower right (l.r.) in ink: E.M.H. ; l.c. in ink in Dr Hocken’s hand: Mr Wohlers’ grave, Ringaringa Point, Stewart’s Island (Taken March 1896; on mount in ink: T.M. Hocken; label: Na Te Hakena Tenei Tiki; note: In 1843, the NZ Company brought out many German emigrants from Hamburgh in the St Pauli for Nelson, amongst them was the Rev J.F.H. Wohlers of the North German Missionary Society, who finally settled at Ruapuke in the middle of May 1844 & was greatly aided by the well-known surveyor, Frederick Tuckett. Here he laboured amongst the natives until the time of his death in 1885. Here he was surrounded by the greatest hardships & abject privations, his sole break & holiday was a voyage in an open boat to Nelson in 1849, where he married a widow, Mrs Elise Palmer, by whom he had a daughter, afterwards married to Mr Arthur Traill of Stewarts Island. He contributed valuable papers on mythology to the Transactions of the NZ Institute. His interesting life has been written by Mr John Houghton. T.M.H. 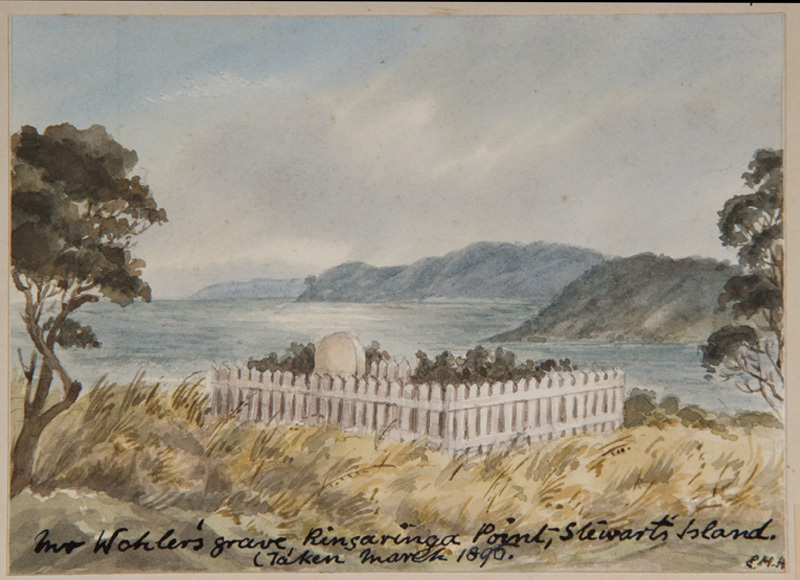 Hocken, Elizabeth Mary, 1848-1933, “Mr Wohlers’ grave, Ringaringa Point, Stewart’s Island. 1896,” ourheritage.ac.nz | OUR Heritage, accessed April 26, 2019, http://ourheritage.ac.nz/items/show/4499.